The Life Of Faith: The perfect Christmas gift Giveaway! Is spending time with Jesus something that you long to do every day? I know I desire to be in the word and to be spending time with Jesus, but I don't always make the time for it. It sometimes helps me to have some sort of devotional to get me started and keep me on track. I don't believe in replacing time in God's word with a book or devotional, however both can be very useful tools in setting up structured time in the Word! I'm always on the lookout for a good book or devotional and I'm so excited to begin 2013 with Nancy Leigh DeMoss's new Devotional The Quiet Place. "You want to spend time with God each day---and you'd love to find great joy in doing so---but it's not easy! Encouraging you to try again, DeMoss offers fresh and relevant reflections on the attributes, purpose, and character of God in this year's worth of readings selected from her best-selling books." Looking for the perfect Christmas gift for your wife, mom, sister, friend, or even yourself (sshh we won't tell;)? 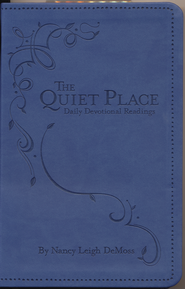 Enter to win your very own leather bound copy of Nancy Leigh DeMoss's new Devotional The Quiet Place! I don't always do my best when it comes to finding time to spend with Jesus even though I crave it. I tend to let things get in my way. If I have devotional book, I feel like it will keep me more accountable when it comes to spending time with my First Love. I love Nancy Leigh De Moss. 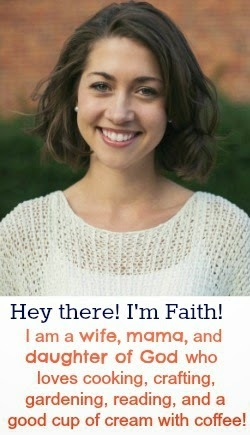 This Devo is on my wish list for sure. SHe is one of the best Bible Teachers I have read. I also agree with you about not replacing God's word with Devos tough! But oh, this is a good one to supplement Bible reading with for sure! Oh cool, I am always looking for new devotional s! It's always nice to have fresh material to study! Thank you for doing this give-away! I could actually use a new devotional, so I'm hoping to win it for me!